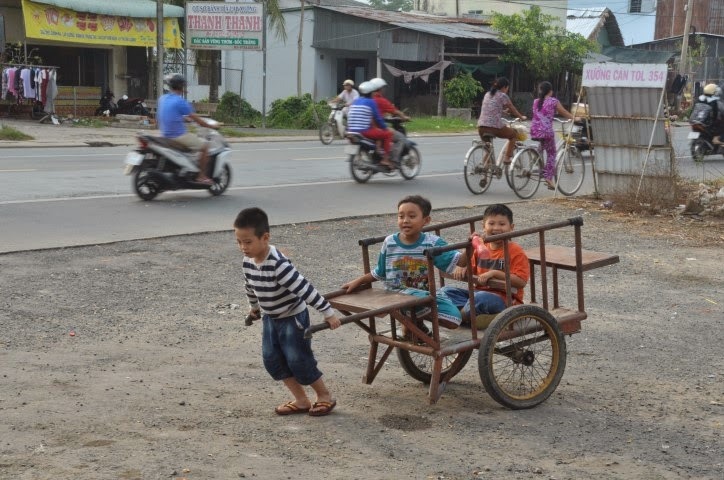 My cousin, Khiêm came with his motorcycle, typical transportation for the majority of the people in Vietnam, to get me. I hopped on the back and told my grandmother that I will be back in a short time. He drove me to his home in Soctrang (a few miles from Nga Ba An Trach where I am staying) so I can visit with him and his family. That visit lasted 12-hours long! 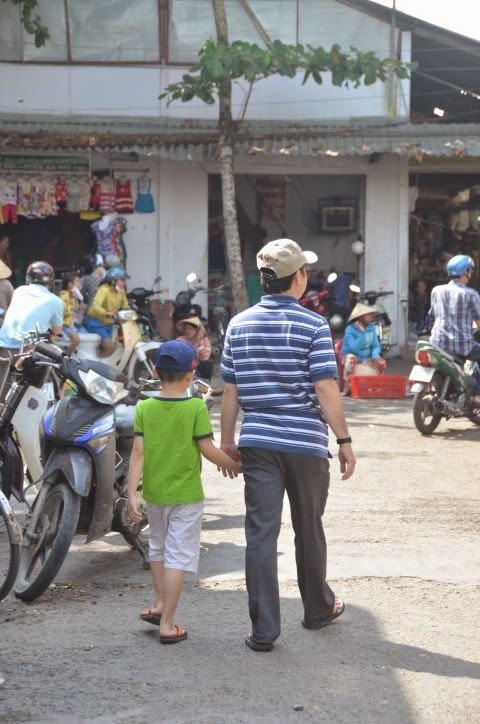 While there Khiêm, Toàn (his youngest son) and I walked down the road from their home to their local market. 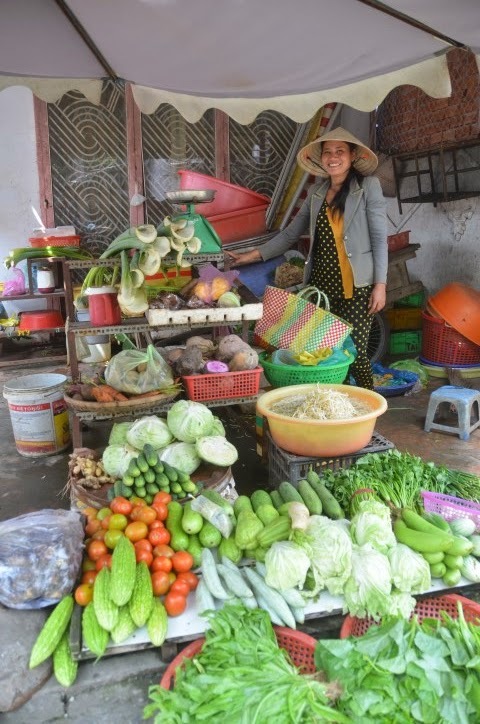 We bought some new vegetables that I have never eaten before known in Vietnamese as rau đắng. The direct translation is bitter herbs. I called it bitter herb but honestly I have not come across any reference to the correct name. I am not sure if this is considered an herb. My cousin informs me this vegetable/herb is usually grown in the wild. 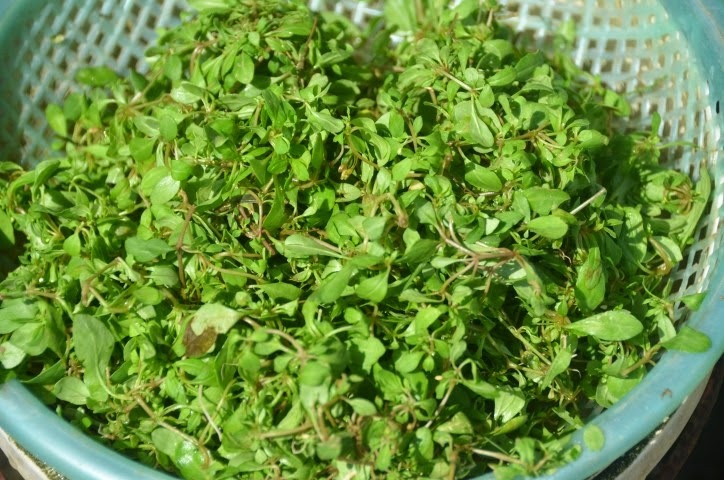 Since people like to eat these herbs some farmers have cultivated them to sell. These herbs are usually blanched and eaten immediately. If they are steeped too long they will become very bitter. 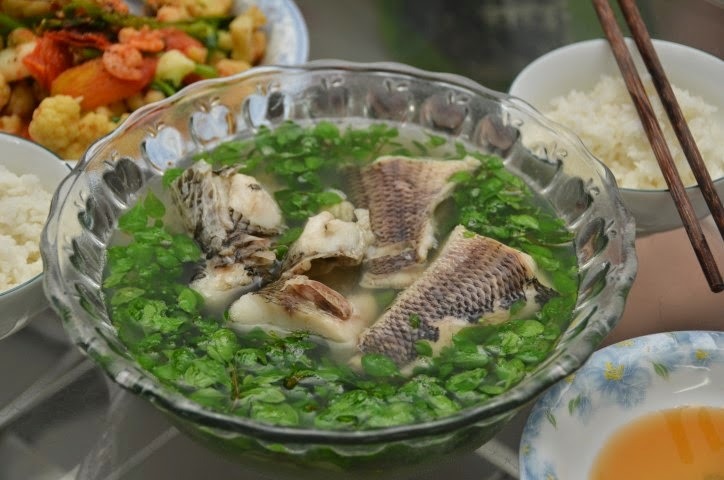 Ngọc (Khiêm's wife) had some cá lóc (snakehead fish) which she was going to make into a classic Vietnamese sour soup called canh chua. However, because she is flexible and wanted me to try the bitter herbs she made me bitter herb soup instead. 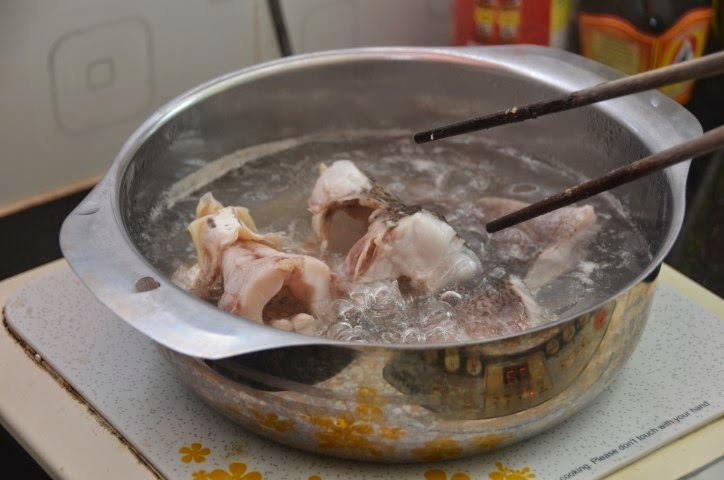 She made a broth with her snakehead fish and poured it over the prepared bowl of bitter herbs. 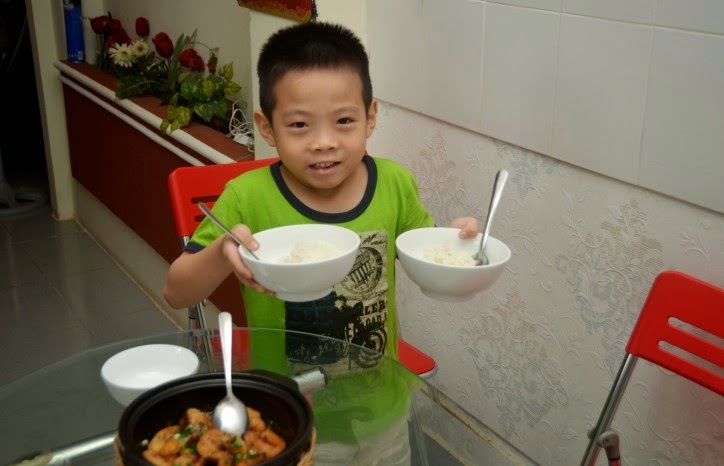 The children found the soup to be too bitter but for us (older adults) we really enjoyed it! Here is Ngọc's recipe. Cám ơn Ngọc!! 1) Pour water in a medium sized pot. Heat over medium to high heat. 2) Once the water comes to a boil add fish. Cook for about 10 minutes or until the fish is cooked. 3) Add salt to taste. 4) Place the cleaned and prepared herb in a large bowl. Pour the hot broth and fish over it and serve immediately. *Cá lóc or snakehead fish is a type of fish that is popular to eat and found throughout Vietnam. It is an invasive species in the United States and live ones are illegal to bring in to the States. (in Nga Ba An Trach). 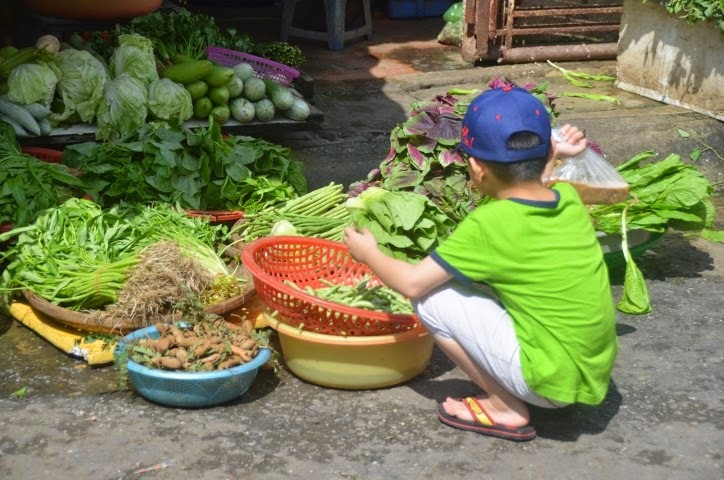 Toàn inspecting the vegetables and herbs in the market. He helps by carrying supplies bought at the market. Cousin Ngọc preparing a fish broth for the bitter herbs. 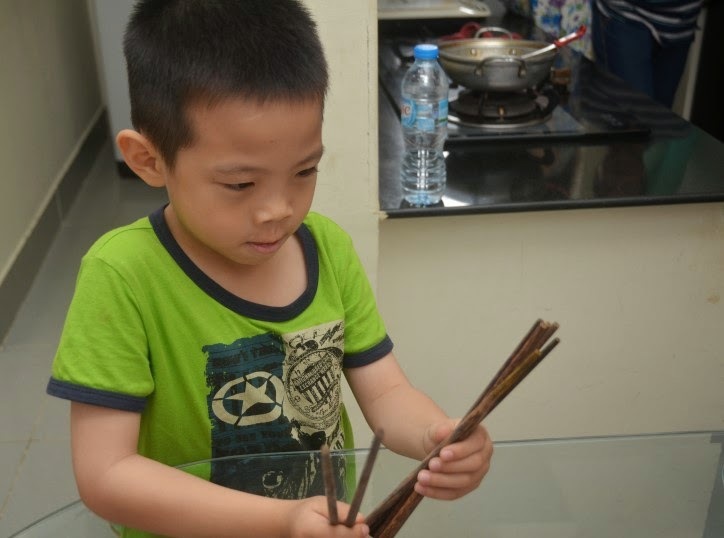 8 year old Toàn is a big helper in the kitchen! He makes sure there are enough chopsticks per person. 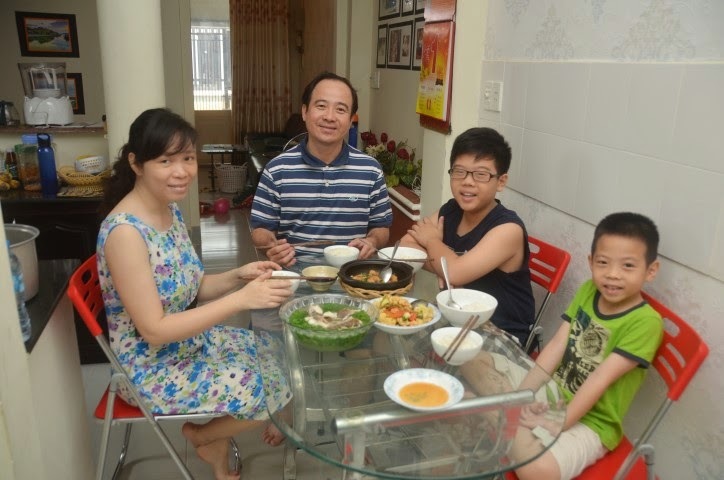 He brings rice bowls to the table for all of us. and fell asleep on the couch! *According to my cousin, Khai there are 2 types of this rau dang (bitter herb). One is rau đắng biển (translates to ocean bitter herb) and the other is rau đắng đất (translates to soil bitter herb). The rau đắng biển is good for stir fried or in a stew. Rau đắng đất is usually eaten by having the hot broth pour over it as above recipe. Khai also mentioned that rau đắng đất is uglier than the ocean kind but it is tastier.